- My main takeaway is that eating Paleo is very time consuming. I basically cook something at each meal, which requires prepping meats, chopping vegetables, multiple pans going, lots of ingredients and major clean up. It is very different from just grabbing a yogurt in the morning and having a turkey sandwich at lunch. I think this is part of the learning curve though. I have to be better at meal planning and taking some time out of my busy weekend schedule to sit and prep meals in advance. There aren't enough hours in my day as it is to do what I need to do, let alone all this prep and clean up, so I feel like it is a full-time job eating this way. I will need to figure out a balance...and I will! - I am shocked at how I don't really crave carbs! Well, I should say I didn't crave carbs until I made pancakes for M last night and wanted to shove a whole syrup covered pancake in my mouth and taste the sugary doughy goodness. The craving subsided quickly though once I had my own dinner. And surprisingly it didn't come back when I was cleaning our plates. Normally if she had leftovers I would attack those babies as soon as I could...probably why I have gotten so fat! - Eating Paleo is not cheap. Of course in these last two shopping trips I had to purchase all sorts of wild ingredients to keep in the pantry (ghee, almond flour, coconut oil, oh my!) so our grocery bills were astronomical, but having to purchase meats for almost every meal and fresh veg and fruit really adds up. Especially when you are shopping at Whole Foods. My husband did make a good point though...before we started this we were ordering food or eating out and spending probably more money than I am now on groceries. Good point my love. 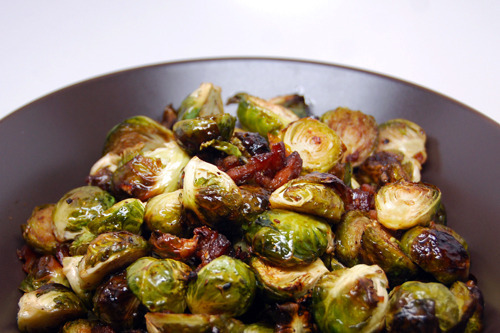 Brussel sprouts and bacon! Sign me up!! - Paleo recipes are amazing. Seriously, I have not had a bad meal all week. And while making food is time consuming, I am having so much fun experimenting with new ingredients. My favorite site is NomNomPaleo.com. I have tried about 5 of her recipes in the last week, each one better than the rest. Her slow-cooker pork? To die for! Avocado soup? One of my lunch go-tos. Who knew eating healthy could taste so good? - It isn't hard to eat this way. I am sure the idea of eating just meat, veg and fruit scares people, but seriously it isn't hard to go without that crap you used to eat (not that I won't sneak some of that crap back into my life after 30-days...or will I? Who knows.) While time consuming, it is fairly easy to come up with something healthy to eat at each meal, as long as your fridge is stocked with plenty of meat and veg. Also, I don't have the urge to snack anymore because instead of 3 big meals I will eat 4 or 5 smaller meals most days. Hungry at 11 AM? Have some leftover pulled pork and roasted peppers! Hungry at 3 PM? Have some carrot salad and some bites of grilled chicken! So those are my main takeaways from week one of eating Paleo. We are now three days into week two, and feeling great. I can totally tell I have lost some weight already, and hopefully by getting back on the workout train this week I will be able to shed some more of this damn baby weight. If you are interested in eating "clean" give me a shout and I will be happy to share some of my favorite resources! That picture.. mmmm.. I love brussel sprouts and bacon. I was stopping by to tell you I nominated your blog for the liebster award. I hope you will come by and check it out.